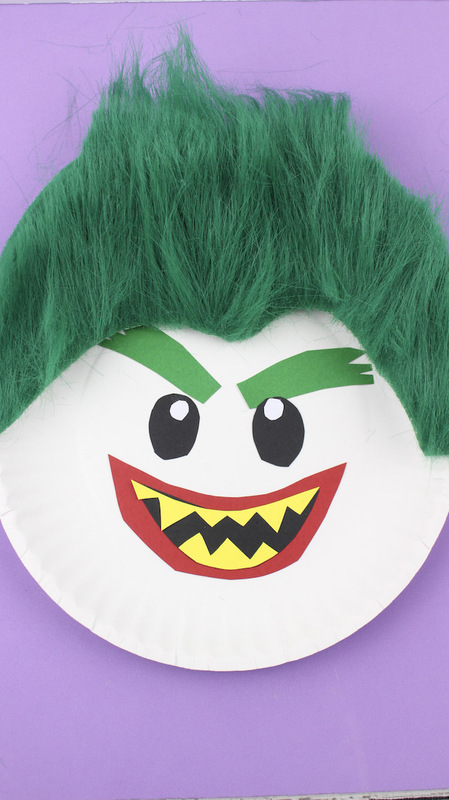 The Joker Paper Plate Craft Tutorial is brought to you by Just Plum Crazy. 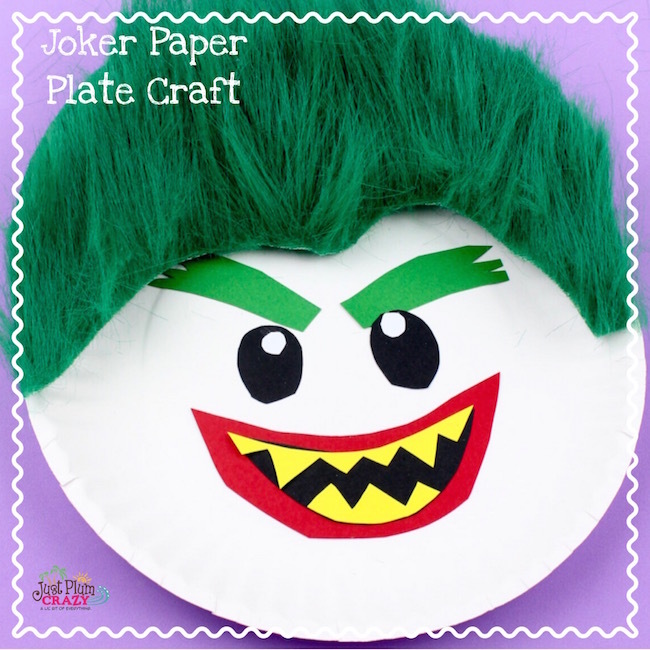 Joker Paper Plate Craft Tutorial! Of course I’ve saved the best for last! 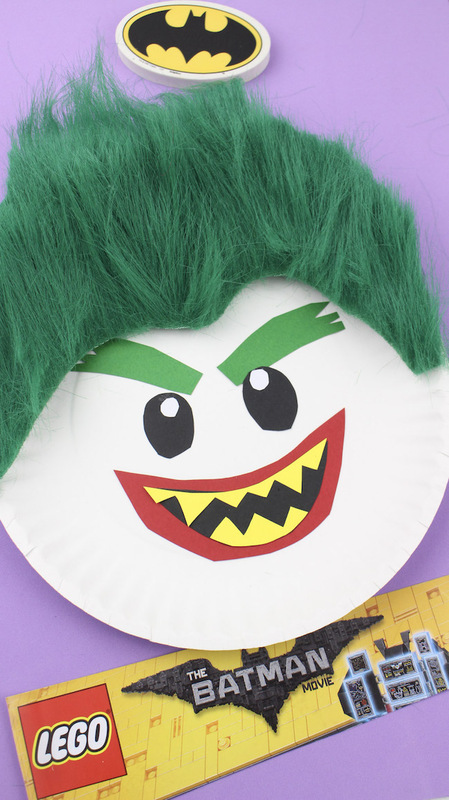 Having posted the Batman Paper Plate tutorial, BatGirl paper plate tutorial, and Robin aka Wonder Boy paper plate tutorial, The Joker Paper Plate Craft Tutorial is my favorite. I don’t know if it’s the hair or what but it is definitely the most fun looking. 1. 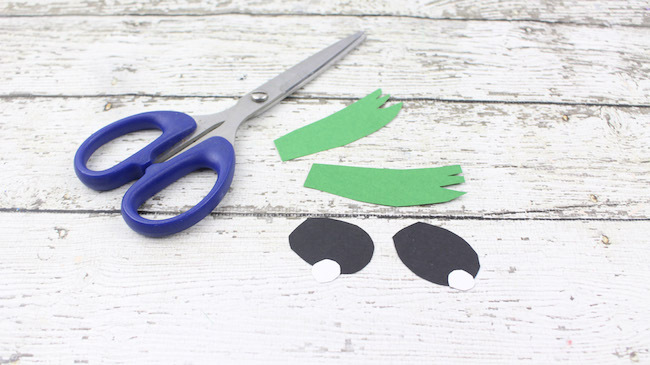 To make the eyebrows, cut out 2 slightly curved strips that are 2 1/2 inches long and 1/2 inch wide from the green construction paper. Cut out a few zig zags at the upper end of each eyebrow to make them look “bushy.” Set aside. 2. For the eyes, cut out 2 oval shapes from the black construction paper about the size of a silver dollar. 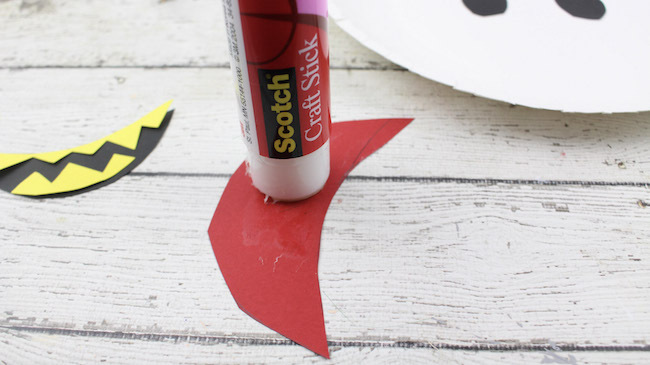 Cut out 2 small oval shapes from the white construction paper that are slightly larger than a pencil eraser. Set aside. 3. 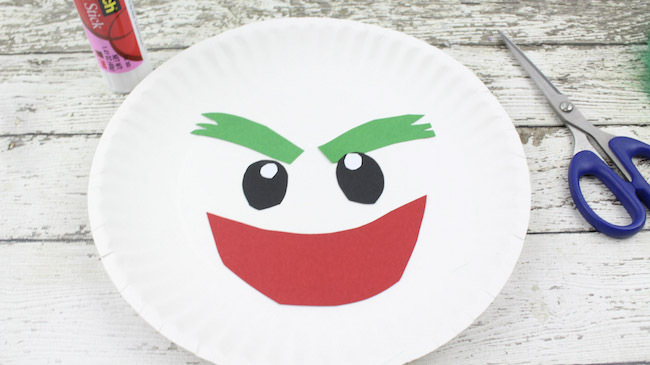 For the mouth, draw a large smile on the red construction paper, 4 1/2 inches across and about 1 1/2 inches long. -Cut the smile out from the paper and place it on the black construction paper. -Trace around the red smile. Cut the smile out from the black paper. -Cut the black smile 1/4 inch smaller all around the diameter so it fits inside of the red smile. 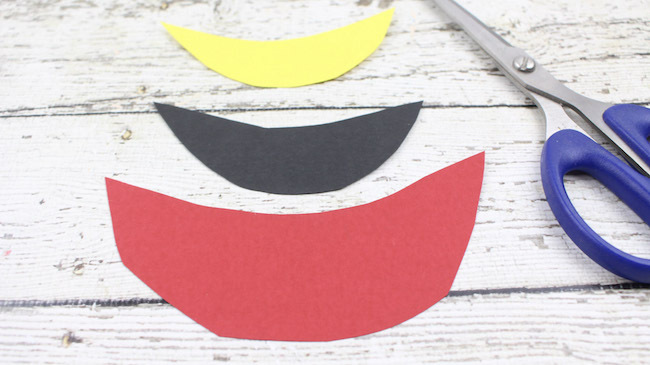 -Place the black smile on top of the yellow construction paper and trace around it. 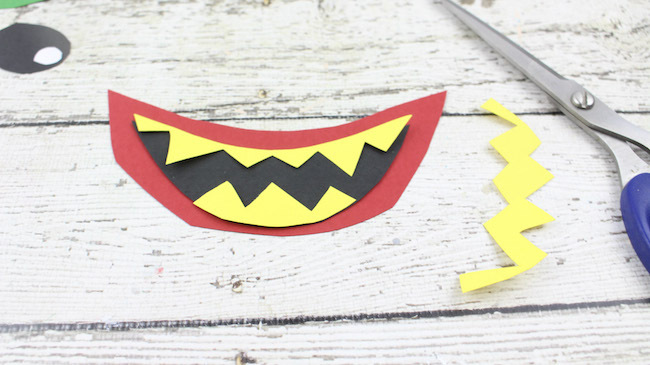 -Cut out the middle of the yellow smile by making zigzag cuts to resemble sharp teeth. 4. 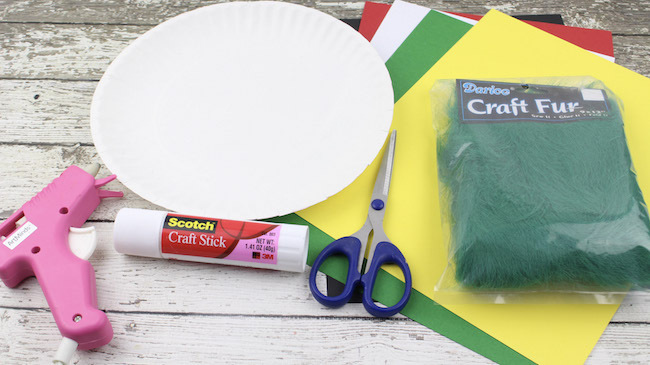 For the hair, cut out a piece from the green craft fur that is 9 inches across and 4 inches wide. 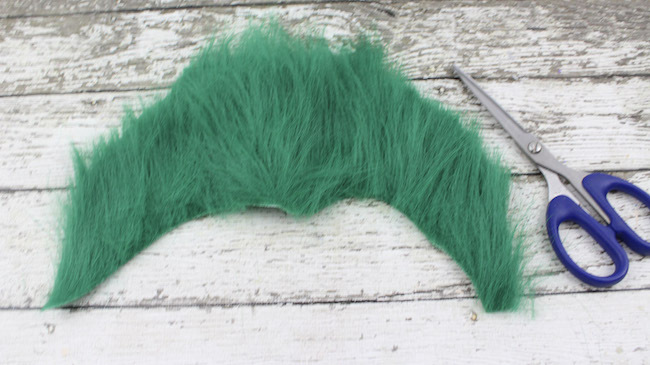 Cut the fur to resemble the Jokers hair and have it slightly ‘dip’ in the middle of the forehead. 1. 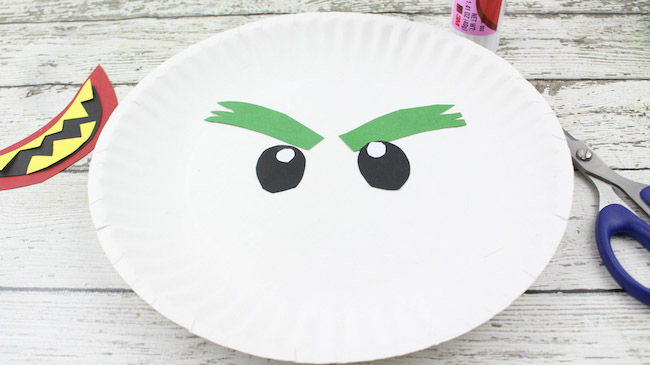 Apply glue to the back of both eyebrows and press down firmly on the paper plate. 2. For the eyes, apply glue to the back of each white oval circle and place at the top of each black oval circle, directly in the middle. Glue both eyes onto the plate, underneath the inner part of each eyebrow. 3. 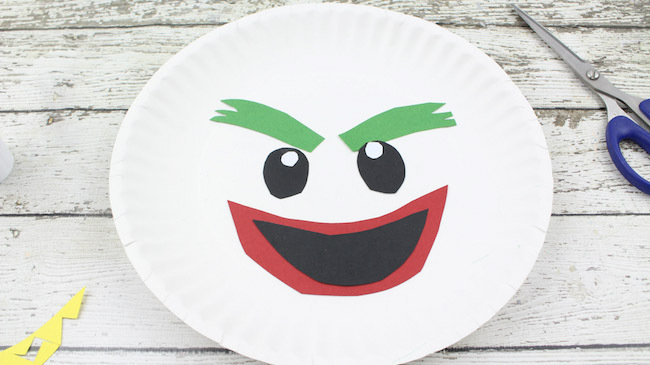 Glue the red smile on, towards the bottom of the plate. 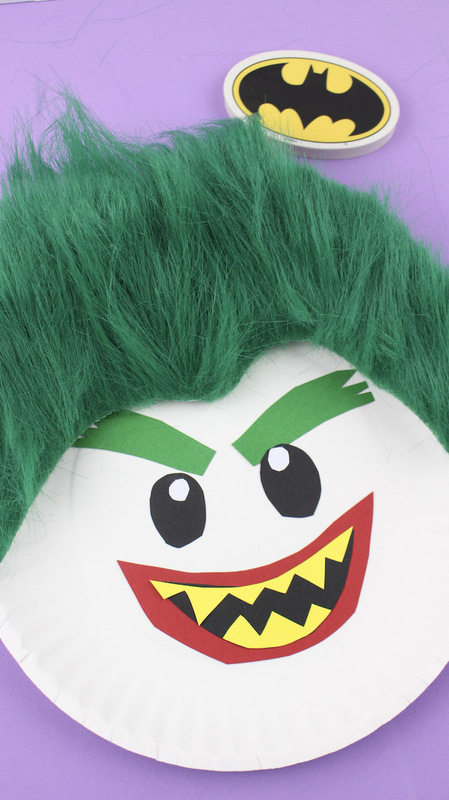 Apply glue to the back of the black smile and place directly in the middle of the red smile. Apply glue to the yellow zig-zagged smile and place on top of the black smile. 4. 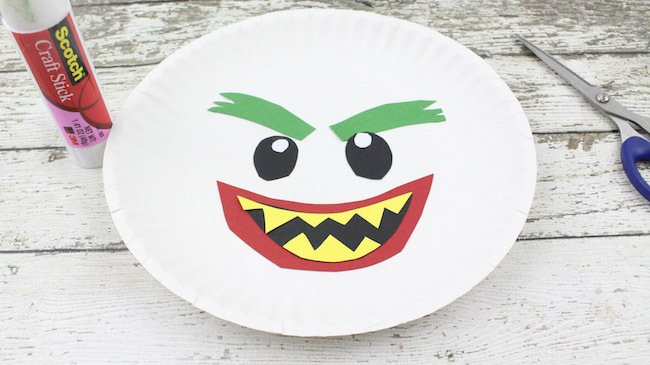 Apply glue from the hot glue gun all along the upper edge of the paper plate and the forehead. 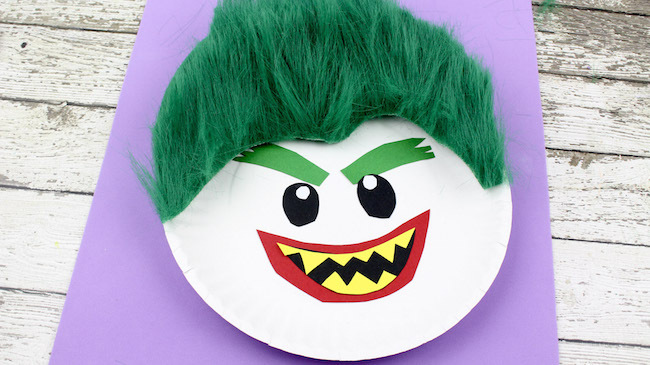 Place the hair on top of the paper plate, above the eyebrows and press down firmly to allow the hot glue to adhere.